and October still offer the chance to continue the summer socialising but with an added cosiness}} that will create that lovely atmosphere of hibernation that autumn brings. Robert Dyas has got everything you need to throw the ideal Indian summer soiree and make the most out of your garden. Warmth is vital for keeping the party going once the temperature drops and the Tepro Silver City Fire Pit with Spark Guard (£75.99) is ideal for keeping you toastie. The Bonnington Garden Fire Pit with Integrated BBQ(£56.99) would be a great addition to any autumn gathering, it will provide the perfect place to toast your marshmallows and create some autumn treats. The La Hecienda Colorado Chiminea (£134.99) will bring a brilliant sense of glamour to any occasion. Create the right atmosphere with Eureka Retro Lightbulbs (£22.99) and add that extra glow needed in those early days of autumn. 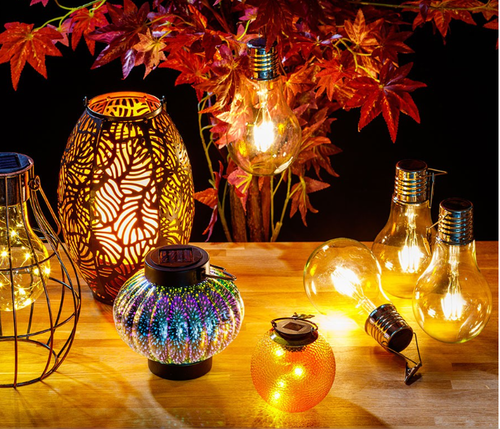 The Smart Solar Damasque Lantern (£19.99) will make a statement in your garden, adding illumination from dusk to create a beautiful ambient effect and bathe your lawn in dappled patterned light. The Monaco 9 Seater Rattan Corner Dining Set (£699.99) is great for relaxing and entertaining and with its deep padded sofa cushions you will be in complete comfort. The Charles Bentley Rattan Day Bed (£499.99) is the definition of luxury. Keep the chill off with the Deyongs Shelley Check Throw (£10.49). By mixing a few of the different autumn colours available you will create a real sense of warmth. Theme with throw pillows to create a depth of textures. Another great way to get that cosy atmosphere is with candles and the Price Scented Candle Jar (£4.99) would be ideal. Add an element of pure relaxation to your summer evening with The Lay-Z Spa Palm Springs Hydrojet Hot Tub (£699.99). It is just what you need after a long hard day. You can add an extra element with mood music with the Kitsound BoomBar Plus Portable Wireless Speaker (£19.99) which is brilliant for adding that extra dimension. Media information provided by Famous Publicity. For further information please contact Mary-Jane Rose at mary-jane@famouspublicity.com or Tina Fotherby at tina@famouspublicity.com or Joanna Mason at joanna@famouspublicity.com or call the office on 0333 344 2341. Robert Dyas, a man of notable character and remarkable determination, founded the company in 1872. He had a vision to provide customers with the best products, service and advice possible – a tradition that continues to be the focus of the company to this day. In 2012, successful businessman and star of BBC TV’s Dragons' Den, Theo Paphitis, bought the company. This press release was distributed by ResponseSource Press Release Wire on behalf of Robert Dyas in the following categories: Men's Interest, Leisure & Hobbies, Home & Garden, Women's Interest & Beauty, Consumer Technology, Food & Drink, Retail & Fashion, for more information visit https://pressreleasewire.responsesource.com/about.